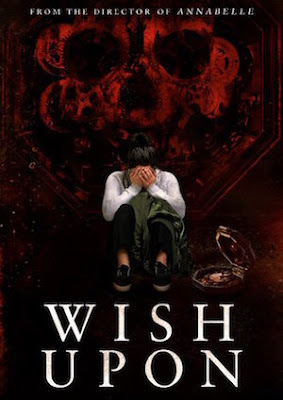 WISH UPON deals with a high school student (Joey King) who comes in contact with a cursed wishpot that her trash picking father (Ryan Phillippe) discovered. She then uses the wishpot to make her dreams come true, only to discover there's a deadly blood price to be paid. What follows are 90 minutes of cheap looking props, day player deaths, PINK PANTHER acting, and actress Sherilyn Fenn desperate to make a mortgage payment. This cursed item mess is available for streaming on YouTube and Amazon, but as always, you're better off leaving the cinematic wishes to us and go watch HELLRAISER again instead.